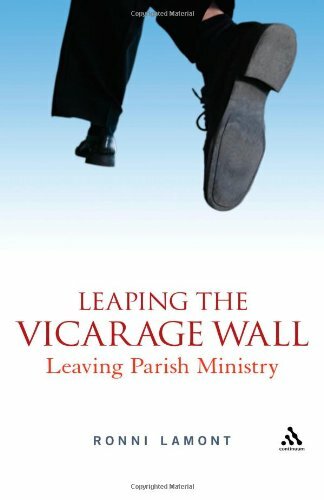 I've just finished reading Ronni Lamont's recent book Leaping the Vicarage Wall: Leaving Parish Ministry, and wanted to share a quick review of it. Writing this appears to have been both therapy and source of frustration for Ronni Lamont, who stopped being a parish priest after several jobs, and now works on the fringes of the church. I sense the therapy comes in finding out that there are lots of others who've done the same as she has -- to the point that Bishops might need to consider this as a new group in their own right. And the sadness and frustration coming from finding some common themes emerging from the others she's interviewed -- themes that have been largely known about for a decade or two. The one area that is probably new is the extent to which female priests are finding the time demands incompatible with what they want for their children, in a way that it seems fewer men resist. And even the flexibility available these days around part-time, self-supporting, or local ministry doesn't (she implies) really help. Some chapters, particularly "Parish Life Explored" and "Personality and Ministry", won't be surprising to many who've had significant contact with the church already, but for younger people exploring vocations, might be a useful eye opener. The chapters on "Theological Training" and "Support for Clergy" are mostly bleak, with some dioceses having 15% of their priests off sick (presumably mainly through stress), and also 15% retiring early. Thankfully there's more positive news at the end when she tackles "Where do we go from here?" The advice about how to set boundaries and expectations, and the need for management and technology training all makes good sense. And certainly the need to find prayer triplets and/or other small cells for support is key. But I feel there are some bigger challenges to the bishops that should be faced by the material she's assembled: if parish-based ministry is noticeably more likely to cause people to leave it than those in chaplaincies, cathedral roles, or para-church roles, then isn't something wrong in the parish? Why does that particularly seem to sap people's sense of themselves? Who would benefit from reading this? I'm slightly surprised to find myself suggesting any ordained person in the Church of England, or anyone working for or living with one. And for anyone thinking of becoming ordained, this should give much pause for thought. Recommended.